Fine screening solutions are a highly interesting alternative when it comes to reducing the solids load in the biological treatment system. Compared to conventional primary settlement tanks, higher reduction rates can be achieved with innovative sewage treatment technology and also investments costs and space requirements can be reduced. Innovative technologies and materials ensure the RakeMax® Hybrid is ahead of the future requirements in wastewater treatment. With its bar rack made of highly wear-resistant fibre-plastic composite material, the screen has proven its capability in daily operation and over long operating hours on several sewage treatment plants in Germany and abroad. On STP Bad Orb, the latest design model of a HUBER Screw Press Q-PRESS® is successfully in service. The plant operators have made only good experiences with this redesigned HUBER bestseller. HUBER supplies three HUBER Screw Press Q-PRESS® units for the new wastewater treatment plant of the dairy company Naabtaler Milchwerke. The units convinced the customer with excellent separation efficiency and dewarering results right from the beginning. 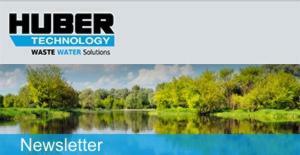 HUBER offers a comprehensive program of high-quality equipment for drinking water supply structures. Our many years of experience and our proven expertise guarantee economical solutions and maximum customer satisfaction for our customers. The HUBER Operation Control (HOC) System offers customers and plant operators a number of advantages. With access to the customer's plant around the clock and wherever in the world, the system is a major contribution to optimised and reliable plant operation.